The American Nation 4/10/2017 Chapter 4 INDEPENDENCE! 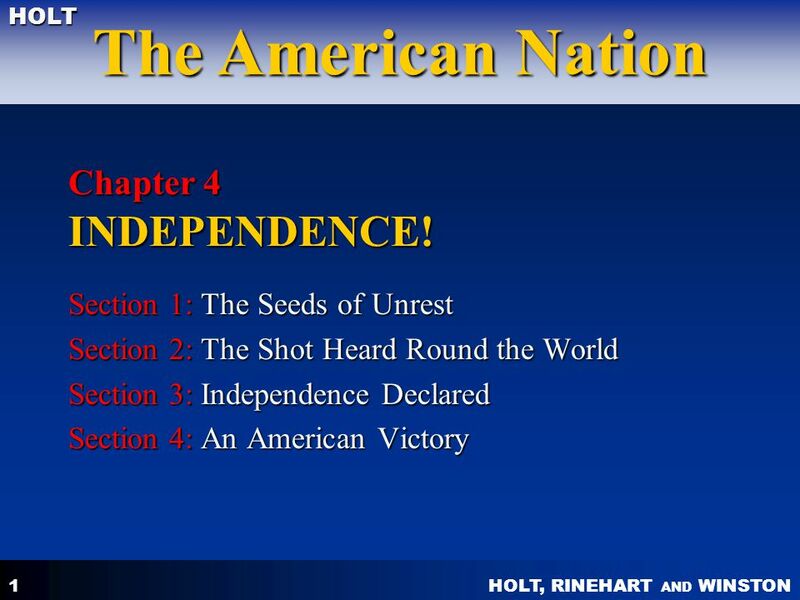 Section 1: The Seeds of Unrest Section 2: The Shot Heard Round the World Section 3: Independence Declared Section 4: An American Victory CHAPTER 4--INDEPENDENCE! How did the British Crown respond to Pontiac’s Rebellion? 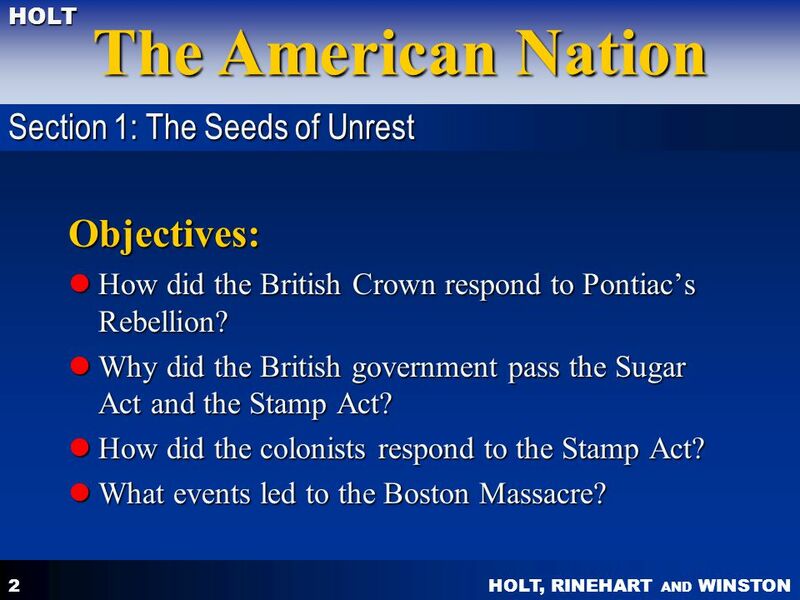 Why did the British government pass the Sugar Act and the Stamp Act? How did the colonists respond to the Stamp Act? What events led to the Boston Massacre? 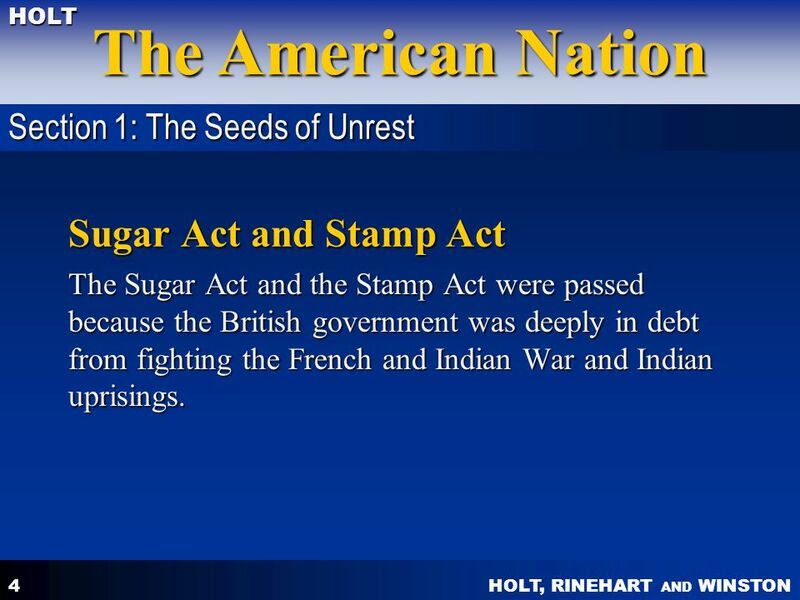 The Sugar Act and the Stamp Act were passed because the British government was deeply in debt from fighting the French and Indian War and Indian uprisings. 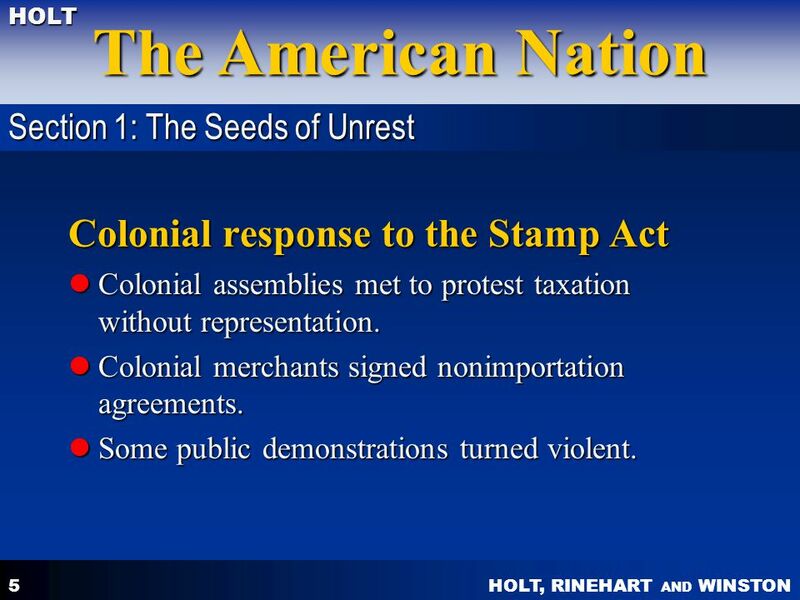 Section 1: The Seeds of Unrest Colonial response to the Stamp Act Colonial assemblies met to protest taxation without representation. Colonial merchants signed nonimportation agreements. Some public demonstrations turned violent. 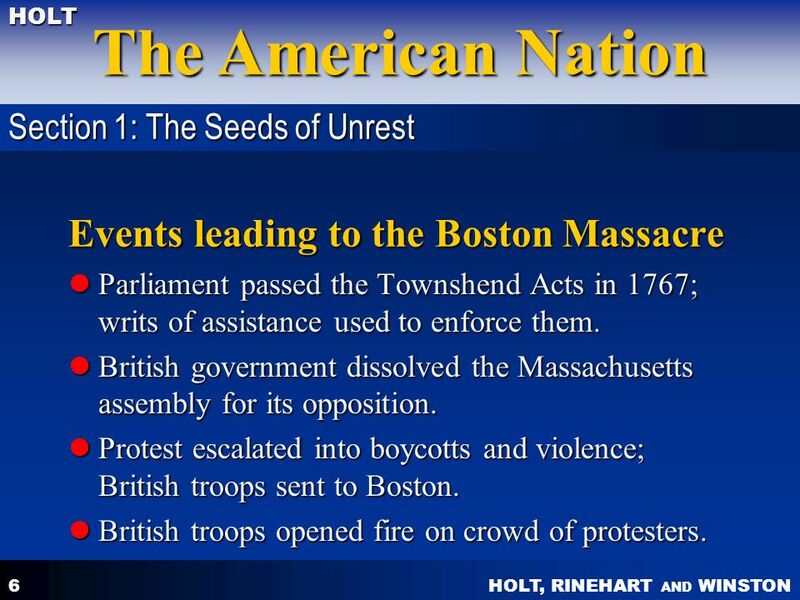 Section 1: The Seeds of Unrest Events leading to the Boston Massacre Parliament passed the Townshend Acts in 1767; writs of assistance used to enforce them. British government dissolved the Massachusetts assembly for its opposition. Protest escalated into boycotts and violence; British troops sent to Boston. British troops opened fire on crowd of protesters. Why did the colonists in Massachusetts stage the Boston Tea Party? 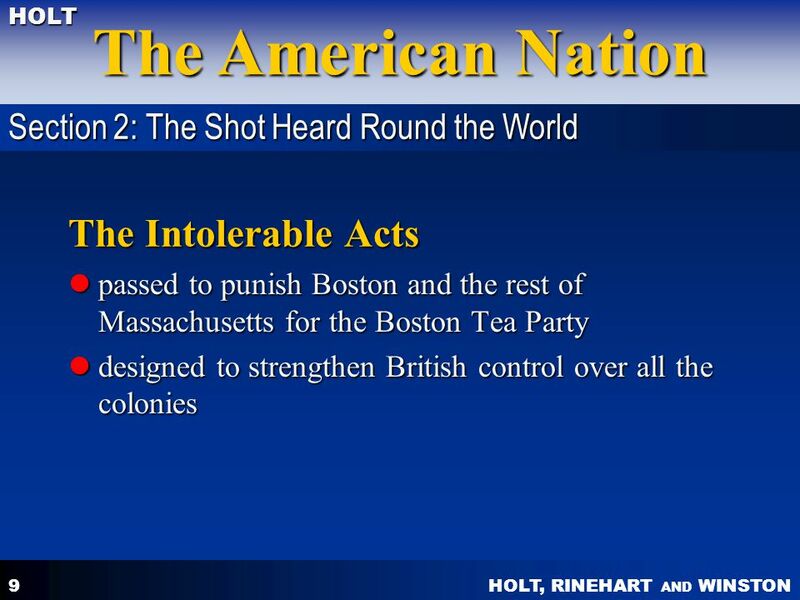 Why did Parliament pass the Intolerable Acts? 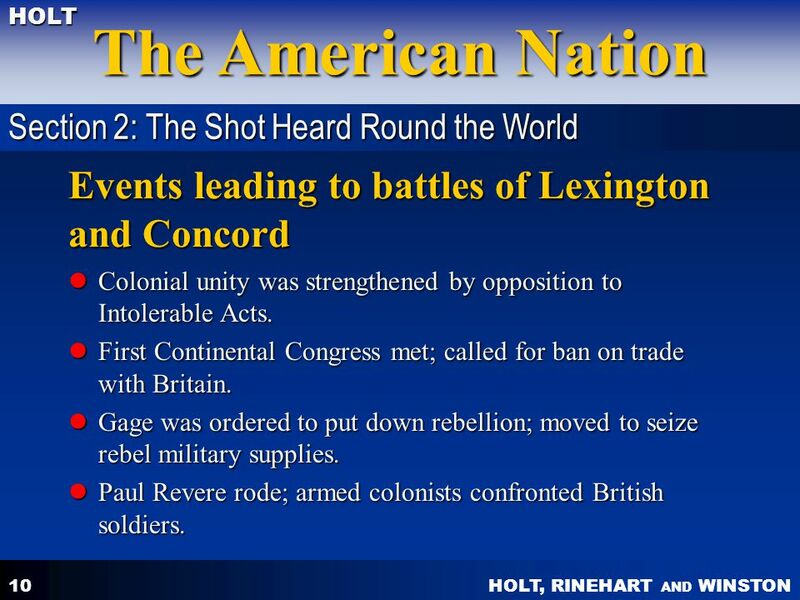 What events led to the battles at Lexington and Concord? 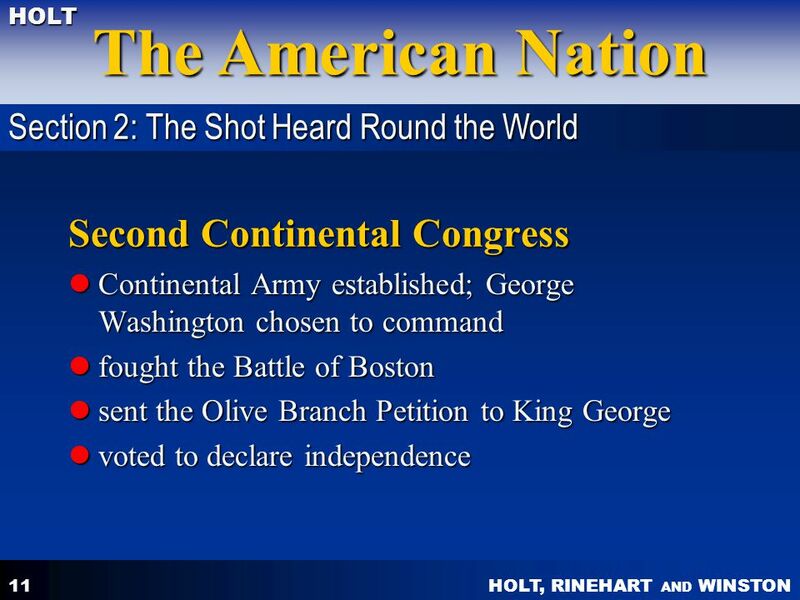 What actions did the Second Continental Congress take? The Tea Act of 1773 was passed to bail out the British East India Company; it gave the company privileges that no American merchants had. 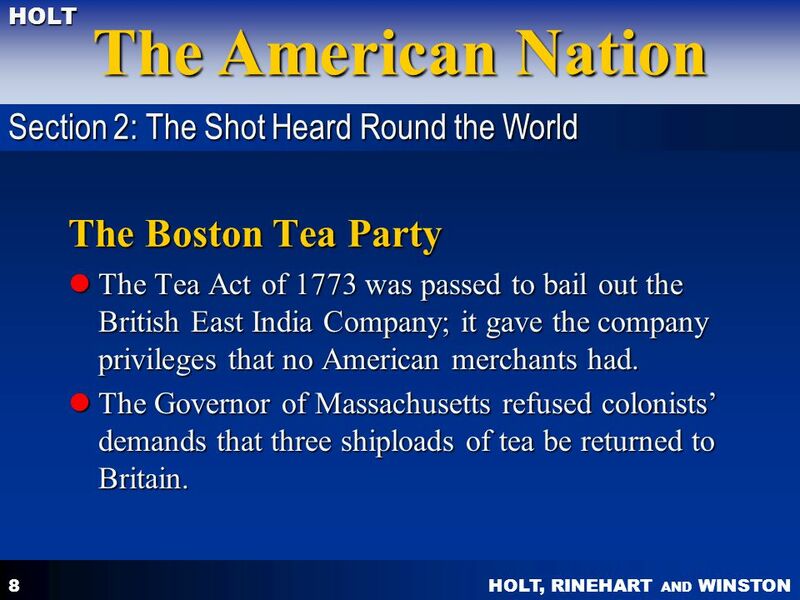 The Governor of Massachusetts refused colonists’ demands that three shiploads of tea be returned to Britain. 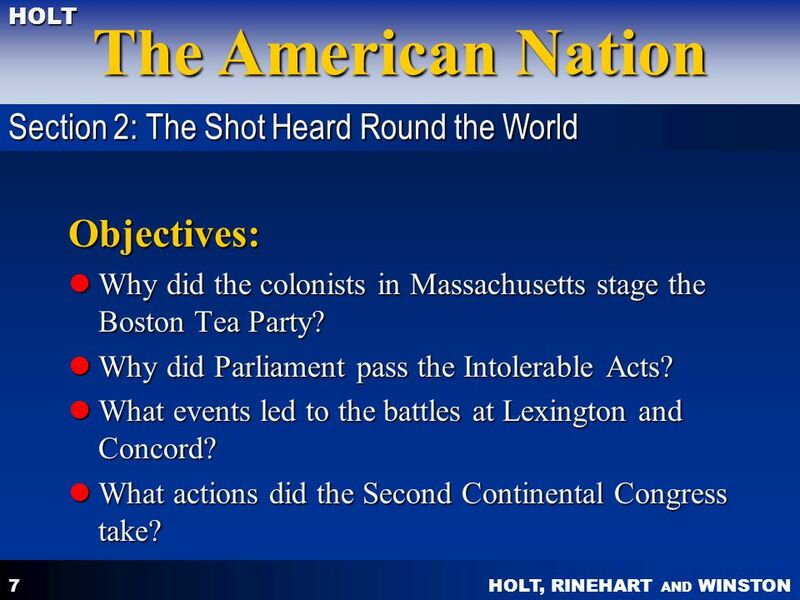 Section 2: The Shot Heard Round the World Events leading to battles of Lexington and Concord Colonial unity was strengthened by opposition to Intolerable Acts. First Continental Congress met; called for ban on trade with Britain. Gage was ordered to put down rebellion; moved to seize rebel military supplies. Paul Revere rode; armed colonists confronted British soldiers. 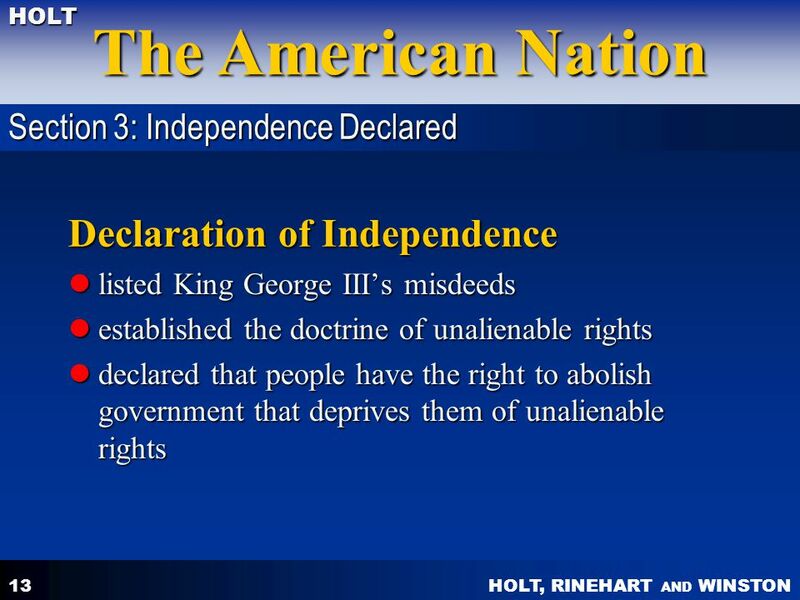 How did the Declaration of Independence explain America’s break with Great Britain? 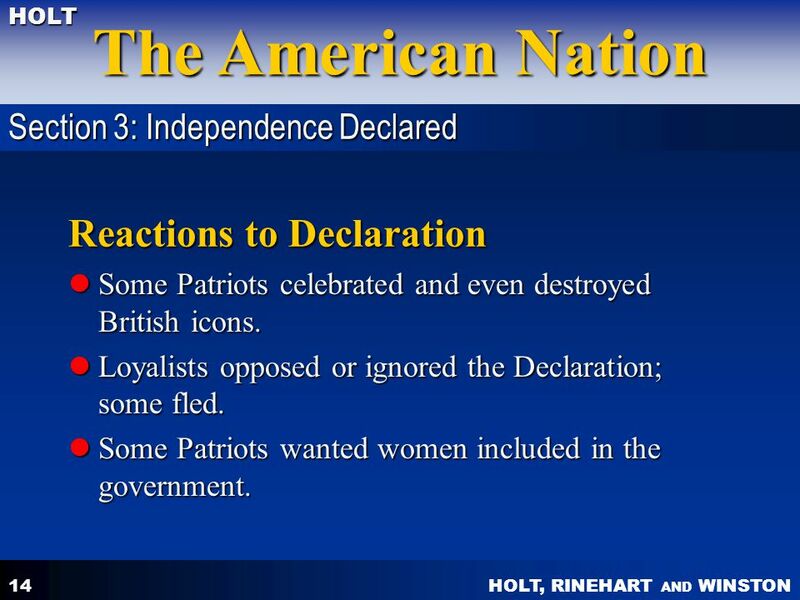 How did Americans react to the Declaration of Independence? 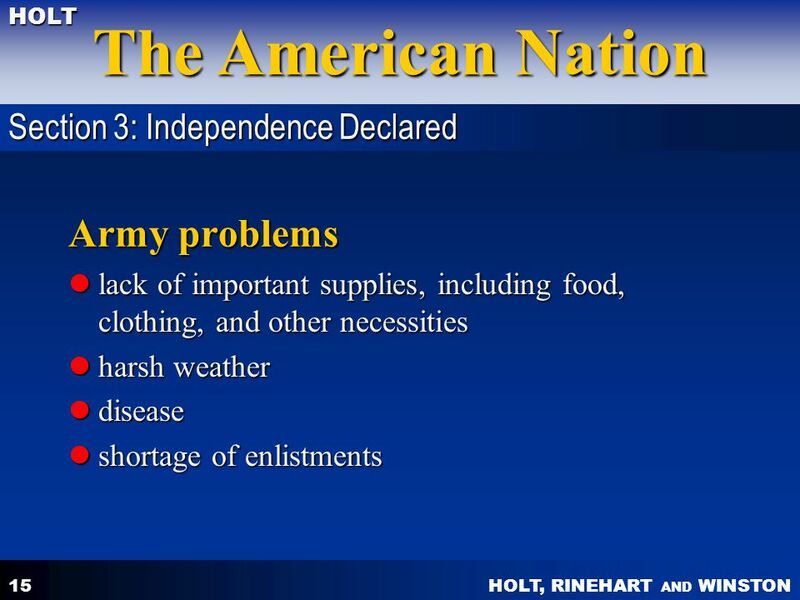 What major problems did the Continental Army face? What roles did different groups of people play in the war? The American Nation 4/10/2017 Section 3: Independence Declared Reactions to Declaration Some Patriots celebrated and even destroyed British icons. Loyalists opposed or ignored the Declaration; some fled. 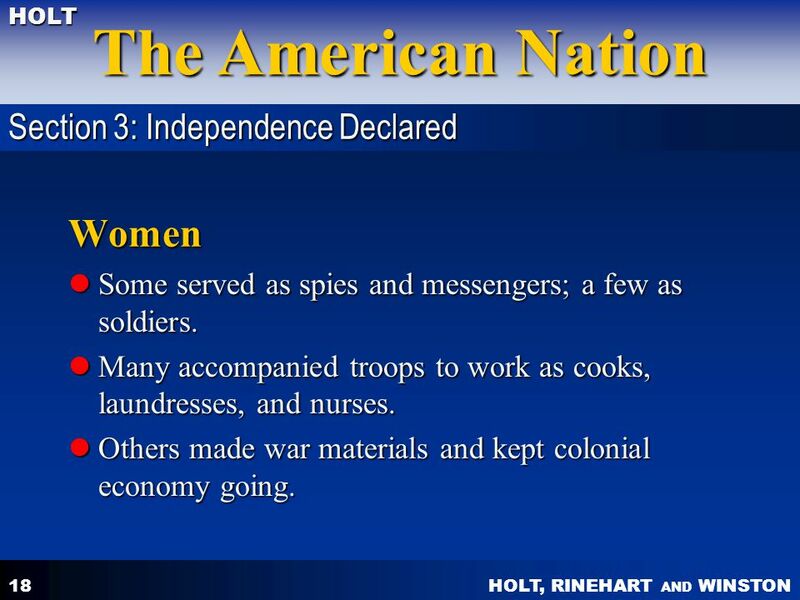 Some Patriots wanted women included in the government. CHAPTER 4--INDEPENDENCE! Some fought for the British to gain freedom. 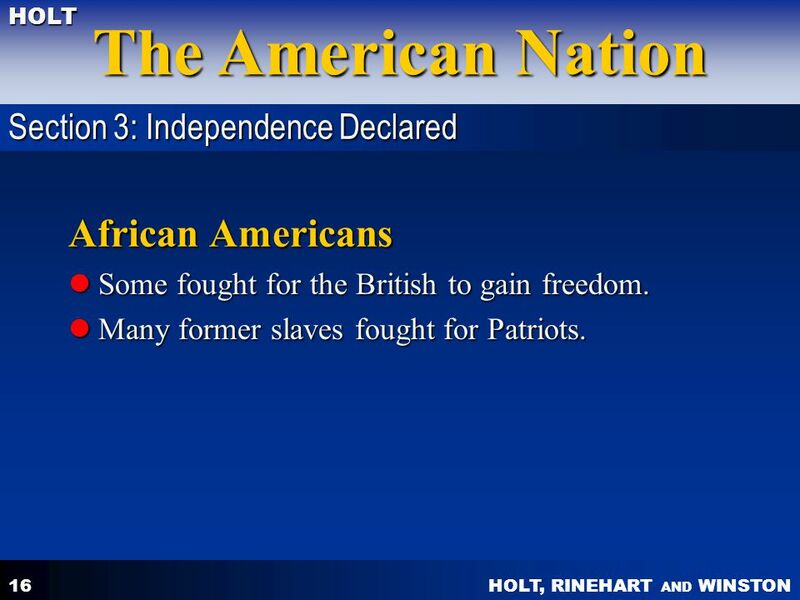 Many former slaves fought for Patriots. 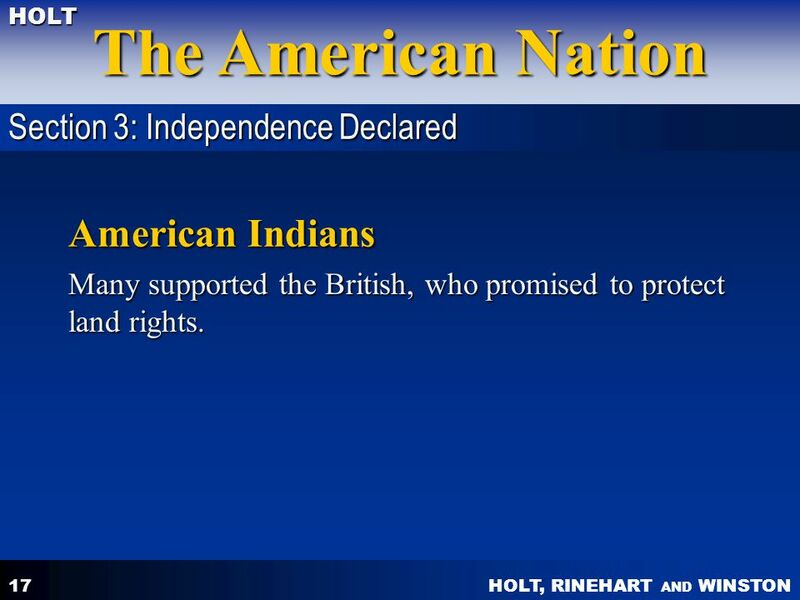 Many supported the British, who promised to protect land rights. Some served as spies and messengers; a few as soldiers. Many accompanied troops to work as cooks, laundresses, and nurses. Others made war materials and kept colonial economy going. 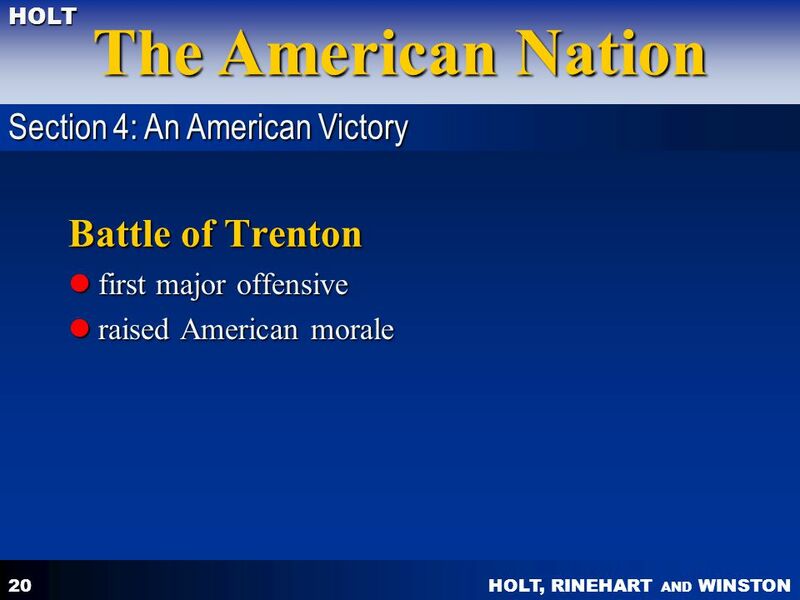 What was the importance of the Battles of Trenton and Saratoga? 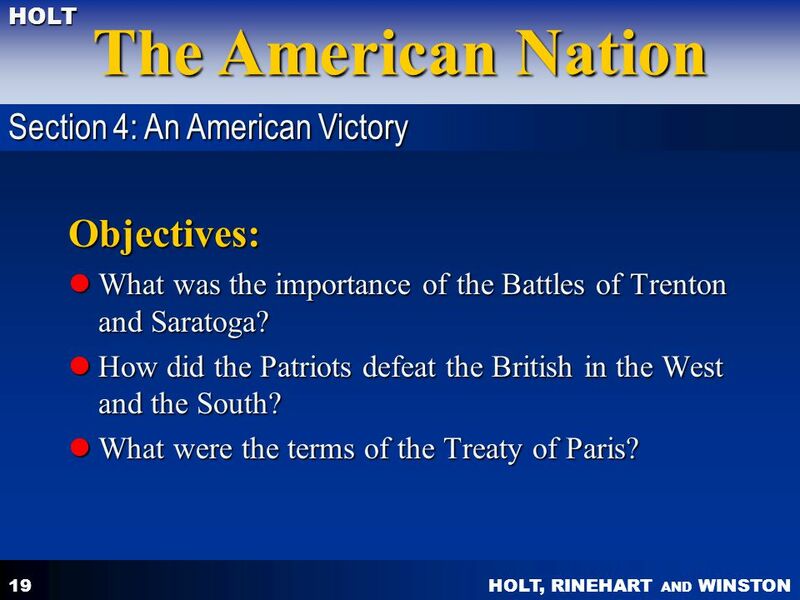 How did the Patriots defeat the British in the West and the South? 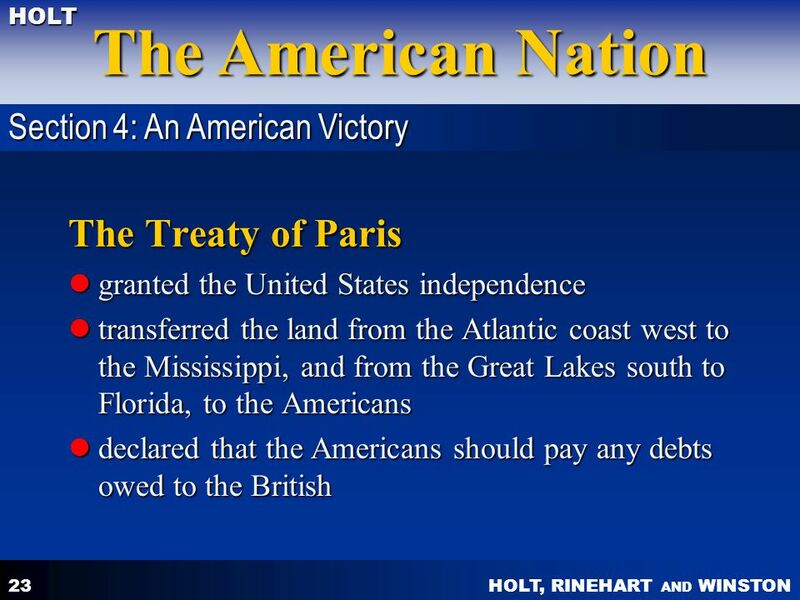 What were the terms of the Treaty of Paris? The American Nation 4/10/2017 Section 4: An American Victory Battle of Saratoga encouraged European countries to become U.S. allies raised American morale CHAPTER 4--INDEPENDENCE! Small detachments of troops gave Patriots speed and flexibility. Small-scale attacks allowed Patriots to attack more places. 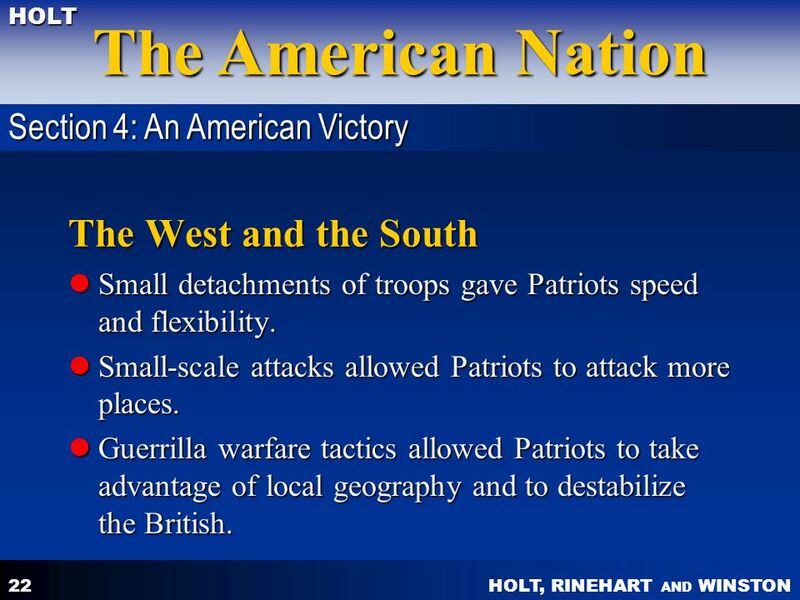 Guerrilla warfare tactics allowed Patriots to take advantage of local geography and to destabilize the British. 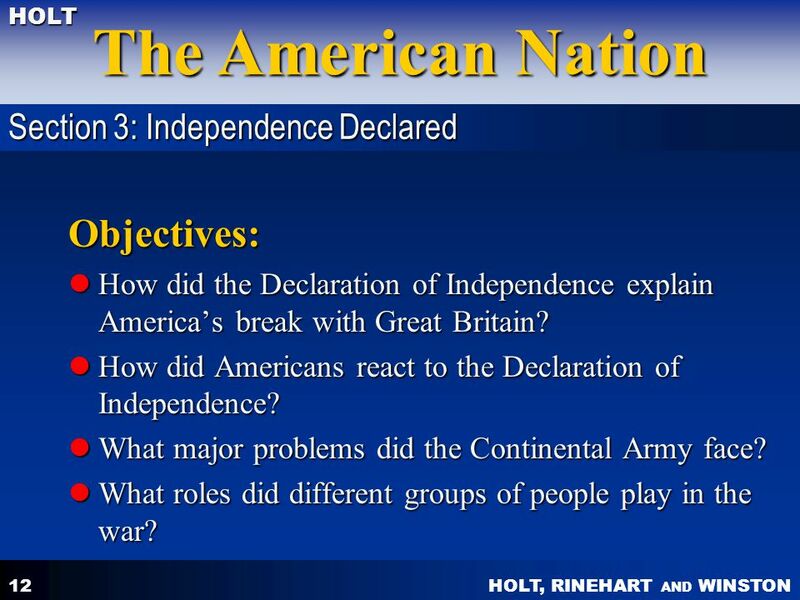 Download ppt "Chapter 4 INDEPENDENCE! 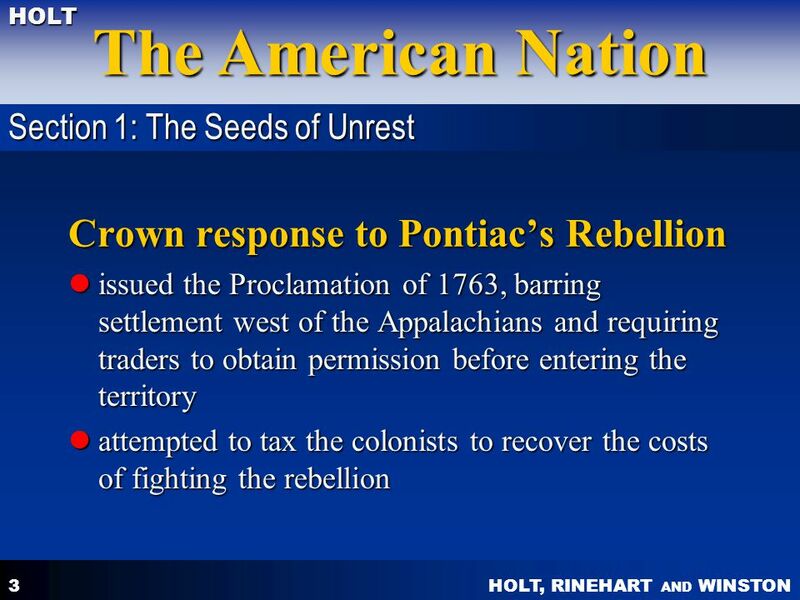 Section 1: The Seeds of Unrest"
C ALL TO F REEDOM HOLT HOLT, RINEHART AND WINSTON Beginnings to CONFLICTS IN THE COLONIES (1675–1774) Section l:Trouble on the Frontier Section. Chapter 5, The American Revolution By: Desiree Lewis. 200 pts 300 pts 400 pts 500 pts 100 pts 200 pts 300 pts 400 pts 500 pts 100 pts 200 pts 300 pts 400 pts 500 pts 100 pts 200 pts 300 pts 400 pts 500 pts. Tighter British Control British Parliament imposes new laws and restrictions Proclamation of 1763 prohibits settlement west of the Appalachian Mountains. Chapter 5 Road to Independence. The Revolutionary Era p. 30-33. Stuff to remember: Sugar Act Stamp Act (internal tax) Townshend Acts (total right to search) British East India Co. Boston.